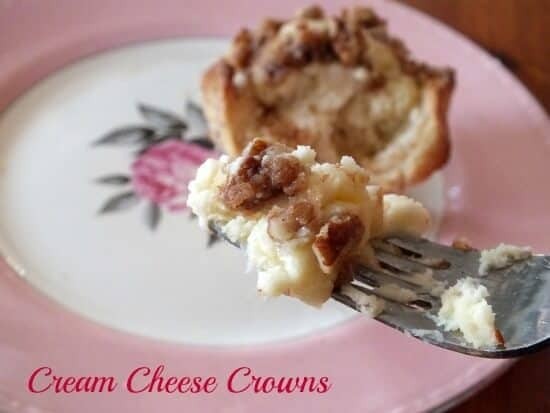 Cream cheese crowns are a made from a buttery yeast dough filled with cream cheese and topped with cinnamon streusel. They rise overnight in the fridge, making them perfect for any brunch. I love cream cheese Danish pastry. I have made laminated dough (the kind of dough that makes the Danish so flaky) a lot over the years but it take a long time and if it is one thing I do not have it is time. These cream cheese crowns are easy to make because you let them rise in the refrigerator overnight and then just bake them in the morning. They take about fifteen minutes in the oven and a couple of minutes to cool down – you don’t want to bite into it too quick because the filling is going to be hot. I made these just plain with pecans but you can put a spoonful of raspberry jam on the dough before you add the cream cheese. The dough is rich and buttery but it is not flaky. It is a sweet roll dough – like cinnamon rolls. If you are looking for light and flaky you could use frozen puff pastry instead of the yeast dough, I suppose. These would be awesome for a brunch. Once in awhile Erin and Jon and the kids will sleep over and we’ll have brunch. And when I say once in awhile I mean once… and I hope that we get to do it again in awhile. Now, you have to understand that Jon likes… no… LOVES breakfast. Eggs, pancakes, waffles, sweet rolls, french toast – and all at one meal. As long as it was served with copious amounts of bacon he would be joyous. I love my son in law. It’s a great combination for a successful relationship. So, let’s talk about these, shall we? Buttery, rich dough is rolled out and cut into squares and then pressed into muffin tins. 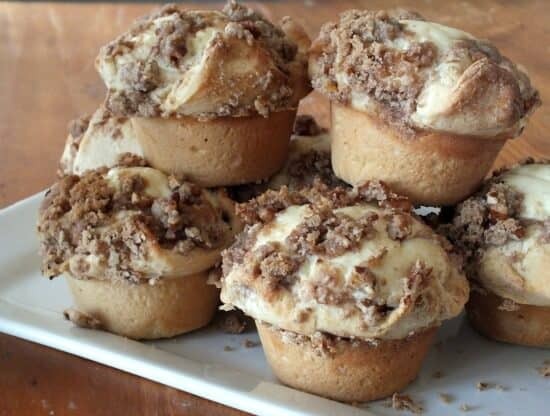 You fill them with a sweetened whipped cream cheese mixture and then sprinkle with a pecan based streusel. Into the fridge they go to slowly rise. Next day, you get up, take them out of the fridge, and while you are making coffee you preheat the oven. Pop the pan in and set the timer for 15 minutes. Take a quick shower, or read your Bible, or paint your nails. Pretty soon the house is going to be smelling pretty fantastic and your family will be stumbling into the kitchen yawning and sniffing. You’ll feel like a Pillsbury commercial. These cream cheese crowns will freeze well, too. You could wrap them up individually, freeze them, and wait until the family leaves for work and school before you eat it. It would be really sneaky but you could – and these are worth it. Sweet, rich rolls with a creamy cheese filling. They are easy because they rise overnight in the refrigerator. Heat the milk to lukewarm – about 110 F.
Stir in 1 tablespoon of the sugar. Stir in yeast and let stand for five minutes – the mixture will be foamy. Beat the eggs and 1 teaspoon of vanilla with a whisk. Add eggs to the milk mixture and whisk until smooth. Combine remaining 4 Tbsp. sugar, flour, and salt in the bowl of a stand mixer fitted with a dough hook. With mixer running on medium speed, add 1/2 cup room-temperature butter, 1 piece at a time. Knead on medium-high speed about 5 minutes. Form the dough into a ball and rub with melted butter. Place in a large bowl and let it rise in a warm spot for about 1 1/2 hours, or until double. Mix the pecans and brown sugar, flour, cinnamon, and nutmeg in a bowl. Add the butter and blend in with your fingers until the mixture is crumbly. Roll the dough out into a rectangle and cut into 12 squares. Press the dough into each cup. Add a spoonful of the cream cheese filling. Sprinkle the streusel over the top. Next day remove the rolls and preheat the oven to 375F. prep time does not include time in the refrigerator. These look fabulous! And such a wonderful flavor and texture combination. I will definitely make these. 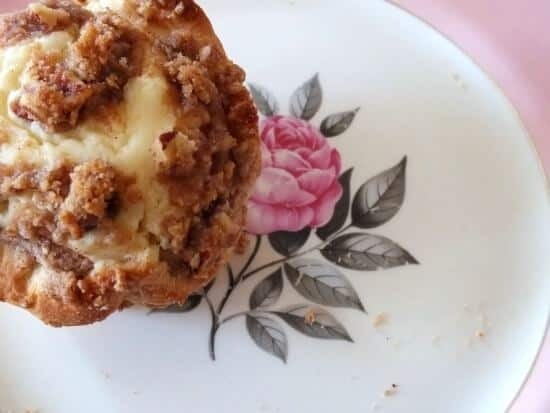 I love, love, love cheese danish and having it in these muffins sounds wonderful! These are superb! Thanks, Marye! Hi! Thanks so much for your reply. I never tasted anything sooo good. I really bake, cook and work out my own recipes. However I did try adding 1 egg to the recipe, it was a lot better, do you think I should also add the flour. hi tried recipe its yyuumm.. however the cheese filling drooped and the dough didn’ t connect to the cheese on top. any help??? Simon I am not sure unless your dough was too wet, the cheese mixture wasn’t firm enough, or it wasn’t baked long enough. Try again and see what happens. If the cream cheese filling seems too soft you can add a tablespoon of flour. Also, I use Philadelphia cream cheese because I think it has the best consistency and quality.